Enjoy S'mores with Hershey's Camp Bondfire! Nothing says Summer like S'mores. Those melty, gooey fireside sandwiches, that evoke memories of good times. Through September 7, you’re invited to discover new ways to “bond” around the campfire with Hershey’s interactive Facebook app, Camp Bondfire. Each week,Camp Bondfire features new tips and ideas surrounding a new weekly theme. This week, it’s Back to School Bonfire” in honor of heading back to school! Register to be a “Camper of the Week” for a chance to win outdoor prizes like a backyard fire pit. Every week, one lucky person will win an outdoor fire pit and S’mores skewer set! As I got to thinking, and Summer is starting to roll out, giving way to Fall. Fall is the perfect season for bonfires. You know, it's cool outside and the nice warm fire feels so good! 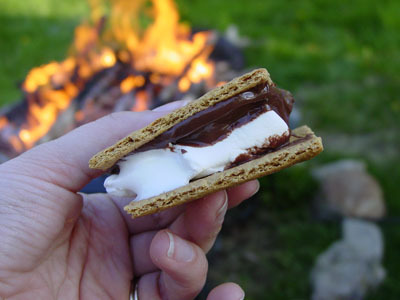 Which means it's also another perfect season for S'mores!